VISA Credit Cards: If you are using a VISA card from another financial institution, chances are you are paying too much in interest charges. Look at your next statement and then compare it to Southern Credit Union VISA options. Apply on line by clicking here. You can download your VISA account in to many budget programs such as Quicken or MS Money. 25 day grace period for purchases. Cash withdrawals at same APR, annual percentage rate. Make payments at the credit union, by transfer or by mail. Applications are subject to credit approval. Complimentary accidental death and dismemberment insurance coverage. Member can elect Credit Disability and Credit Life available; monthly premium based on card balance. 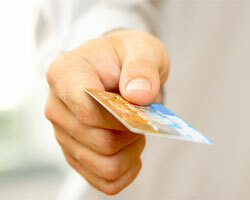 Type of card and interest rate are determined by credit request and credit score, see rates page. VISA secured by a savings account. Great way to establish credit. Opportunity to avoid getting too in debt. Southern Credit Union VISA cardholders have a new tool to answer their questions. Cardholders with a PC and standard Web browser can access their account information online. The Web site is a secure address with a sophisticated array of firewalls. Following an authentication process, you can access payment address information, dispute instructions including dispute forms and important customer service telephone numbers. You can view and print information about your own account such as payment due dates, date and amount of last payment, current balance, available credit, credit limit, transactions posted since last statement, etc. Reminder: SCU will NEVER send you a text or use an automated telephone service to solicit information about your account(s). NEVER reveal private information or account numbers and passwords over the telephone, text message or email unless you verify that it is a legitimate customer service representative from Southern Credit Union. Southern Credit Union is committed to providing a website that is accessible to the widest possible audience in accordance with ADA guidelines. We are working to increase the accessibility and usability of our website for all people. If you are using a screen reader or other auxiliary aid and are having problems using this website, please contact us at 423-629-2578 for assistance. Products and services available on this website are available at our office located at 508 National Avenue Chattanooga, TN 37404 or branch office: 516 Merchants Road Knoxville, TN 37912.